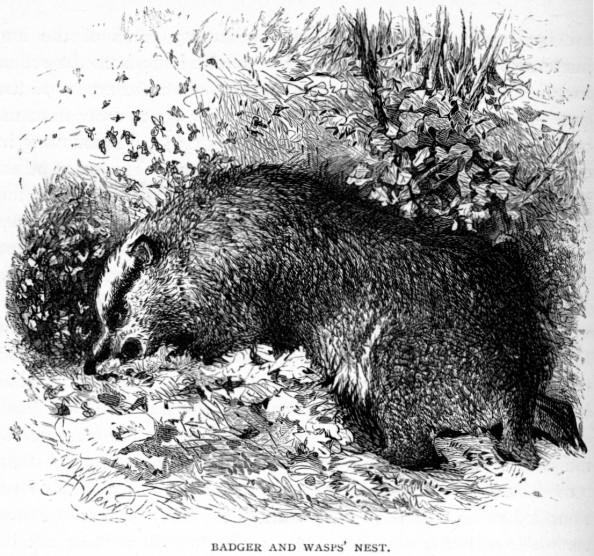 Amongst the aboriginal inhabitants of our wilder districts, who are likely to be soon extirpated, we may reckon that ancient, peaceable, and respectable quadruped, the badger; of an ancient family he certainly is — the fossil remains which have been found prove his race to have been co-existent with that of the mammoths and megatheriums which once wandered over our island. Though the elk and beaver have long since ceased to exist amongst us, our friend the brock still continues to burrow in the solitary and unfrequented recesses of our larger woods. Persevering and enduring in his every-day life, he appears to have been equally so in clinging to existence during the numerous changes which have passed over the face of the globe since the first introduction of his family into it. Notwithstanding the persecutions and indignities that he is unjustly doomed to suffer, I maintain that he is far more respectable in his habits than we generally consider him to be. "Dirty as a badger," "stinking as a badger," are two sayings often repeated, but quite inapplicable to him. As far as we can learn of the domestic economy of this animal when in a state of nature, he is remarkable for his cleanliness — his extensive burrows are always kept perfectly clean, and free from all offensive smell; no filth is ever found about his abode; everything likely to offend his olfactory nerves is carefully removed. I once, in the north of Scotland, fell in with a perfect colony of badgers; they had taken up their abode in an unfrequented range of wooded rocks, and appeared to have been little interrupted in their possession of them. The footpaths to and from their numerous holes were beaten quite hard; and what is remarkable and worthy of note, they had different small pits dug at a certain distance from their abodes, which were evidently used as receptacles for all offensive filth; every other part of their colony was perfectly clean. A solitary badger's hole, which I once had dug out during the winter season, presented a curious picture of his domestic and military arrangements — a hard and long job it was for two men to achieve, the passage here and there turned in a sharp angle round some projecting corners of rock, which he evidently made use of when attacked, as points of defence, making a stand at any of these angles, where a dog could not scratch to enlarge the aperture, and fighting from behind his stone buttress. After tracing out a long winding passage, the workmen came to two branches in the hole, each leading to good-sized chambers: in one of these was stored a considerable quantity of dried grass, rolled up into balls as large as a man's fist, and evidently intended for food; in the other chamber there was a bed of soft dry grass and leaves: the sole inhabitant was a peculiarly large old dog-badger. Besides coarse grasses, their food consists of various roots; amongst others I have frequently found about their hole the bulb of the common wild blue hyacinth. Fruit of all kinds and esculent vegetables form his repast, and I fear that he must plead guilty to devouring any small animal that may come in his way, alive or dead; though not being adapted for the chase, or even for any very skilful strategy of war, I do not suppose that he can do much in catching an unwounded bird or beast. Eggs are his delight, and a partridge's nest with seventeen or eighteen eggs must afford him a fine meal particularly if he can surprise and kill the hen-bird also; snails and worms which he finds above ground during his nocturnal rambles are likewise included in his bill of fare. I was one summer evening walking home from fishing in Loch Ness, and having occasion to fasten up some part of my tackle, and also expecting to meet my keeper, I sat down on the shore of the loch. I remained some time, enjoying the lovely prospect: the perfectly clear and unruffled loch lay before me, reflecting the northern shore in its quiet water. The opposite banks consisted, in some parts, of bright green sward, sloping to the water's edge, and studded with some of the most beautiful birch-trees in Scotland; several of the trees spreading out like the oak, and with their ragged and ancient-looking bark resembling the cork-tree of Spain — others drooping and weeping over the edge of the water in the most ladylike and elegant manner. Parts of the loch were edged in by old lichen-covered rocks; while farther on a magnificent scaur of red stone rose perpendicularly from the water's edge to a very great height. So clearly was every object on the opposite shore reflected in the lake below, that it was difficult, nay impossible, to distinguish where the water ended and the land commenced — the shadow from the reality. The sun was already set, but its rays still illuminated the sky. It is said that from the sublime to the ridiculous there is but one step; — and I was just then startled from my reverie by a kind of grunt close to me, and the apparition of a small waddling grey animal who was busily employed in hunting about the grass and stones at the edge of the lochj presently another, and another, appeared in a little grassy glade which ran down to the water's edge, till at last I saw seven of them busily at work within a few yards of me, all coming from one direction. It at first struck me that they were some farmer's pigs taking a distant ramble, but I shortly saw that they were badgers, come from their fastnesses rather earlier than usual, tempted by the quiet evening, and by a heavy summer shower that was just over, and which had brought out an infinity of large black snails and worms, on which the badgers were feeding with good appetite. As I was dressed in grey and sitting on a grey rock, they did not see me, but waddled about, sometimes close to me; only now and then as they crossed my track they showed a slight uneasiness, smelling the ground, and grunting gently. Presently a very large one, which I took to be the mother of the rest, stood motionless for a moment listening with great attention, and then giving a loud grunt, which seemed perfectly understood by the others, she scuttled away, followed by the whole lot. 1 was soon joined by my attendant, whose approach they had heard long before my less acute ears gave me warning of his coming. In trapping other vermin in these woods, we constantly caught badgers — sometimes several were found in the traps; I always regretted this, as my keeper was most unwilling to spare their lives, and I fancy seldom did so. His arguments were tolerably cogent, I must confess. When I tried to persuade him that they were quite harmless, he answered me by asking — "Then why, Sir, have they got such teeth, if they don't live, like a dog or fox, on flesh? — and why do they get caught so often in traps baited with rabbits?" I could not but admit that they had most carnivorous-looking teeth, and well adapted to act on the offensive as well as defensive, or to crunch the bones of any young hare, rabbit, or pheasant that came in their way. When caught in traps, they never left part of their foot behind them and so escaped, as foxes and other vermin frequently do; but they display very great strength and dexterity in drawing up the peg of the trap, and this done, they will carry off the heaviest trap to an amazing distance, over rock or heather. 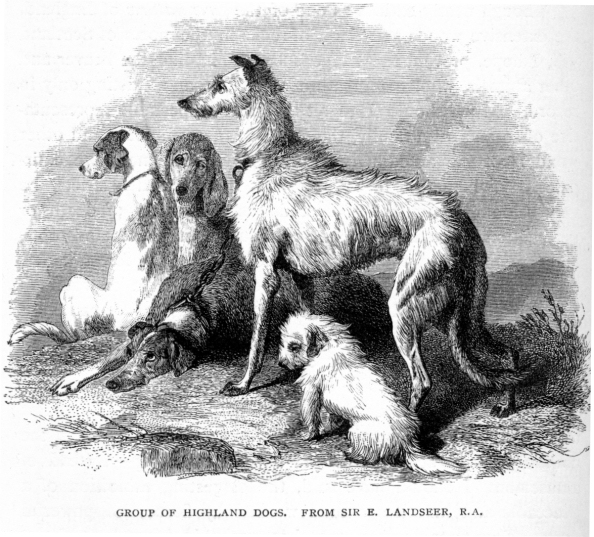 They never attempt to enter their hole with a trap dangling to their foot, but generally lay up in some furze-bush or thicket; on these occasions we invariably found them, by tracking them with a dog who generally attended the trapper, and which dog was peculiarly skilful in tracking animals of this kind. Rover (for that was his name), a strong water-spaniel, was very fond of, and took great interest in, trapping; if he accompanied the keeper when placing his traps overnight, he would often start alone in the morning to take a survey of them, and either kill any animal he found captive, or, if he was not very confident of being the strongest, he would return impatiently for the man, and, running before him, point out plainly where every head of vermin was caught. As for getting into a trap himself, he was far too cunning, but always halting a few yards to leeward of them, and sniffing the air, would at once know if anything was caught. If a cat, marten-cat, or any smaller animal was there, he at once rushed in and killed it; but he waited for the assistance of his friend the keeper to despatch any larger animal. To return to the badger, and his food. One of his most favourite repasts is the contents of the nest of the wasp or wild bee, great numbers of which he must destroy. However far under ground the hive may be, and in however strong and difficult a situation, he digs them up, and, depending on his rough coat and long hair as a protection from their stings, devours comb, larvæ, honey, and insects. Many a wasps' nest I have found dug up in this way, and often far from the badger's usual abode; but the tracks of the animal always made it evident who had been the robber. The badger is easily tamed, and will (if taken young and well used) become much attached to his master. When first caught, their efforts to escape show a degree of strength and ingenuity which is quite wonderful, digging and tearing at their prison with the strength of a rhinoceros. When first imprisoned, if looked at, he immediately rolls himself up into a ball and remains quite motionless. As soon as the coast is clear again, he continues his attempts to escape; but if unsuccessful, he soon becomes contented in his confinement. I one day found a badger not much hurt in a trap. Tying a rope to his hind leg, I drove him home before me, as a man drives a pig, but with much less trouble, for he made no attempts at escape, but trotted quietly ahead, only occasionally showing a natural inclination to bolt off the main path whenever he passed any diverging road, all of which were probably familiar haunts of the unlucky beast. When at home I put him into a paved court, where I thought he could not possibly escape. The next morning, however, he was gone ; having displaced a stone that I thought him quite incapable of moving, and then digging under the wall, he got away. The badger always puts me in mind of a miniature bear, and to this family he evidently belongs. His proportions are similar to those of the bear; his manner of placing his feet on the ground is like that of a bear, and is very peculiar. Beyond the marks of his toes, which, five in number, mark the ground in nearly a straight line, are the impressions of his strong, sharp nails, apparently unconnected with, and at the distance of an inch or two from the rest of his track. These long and powerful nails are a formidable weapon, and in engagements with dogs he makes good use of them, inflicting fearful and sometimes fatal wounds. Though a quiet animal, and generally speaking not much given to wandering, I have occasionally fallen in with his unmistakable track miles from any burrow. His habits are wholly nocturnal, and it is only in the summer evenings, when the darkness lasts but a few hours, that he is ever met with whilst it is light. During winter he not only keeps entirely within his hole, but fills up the mouth of it to exclude the cold and any troublesome visitor who might intrude on his slumbers. Frequently, however, tempted by mild weather in the winter, he comes out for some good purpose of his own — either to enjoy the fresh air or to add to his larder; but never does he venture out in frost or snow. Sometimes I have known a badger leave the solitude of the woods and take to some drain in the cultivated country, where he becomes very bold and destructive to the crops, cutting down wheat and ravaging the gardens in a surprising manner. One which I know to be now living in this manner derives great part of his food during the spring from a rookery, under which he nightly hunts, feeding on the young rooks that fall from their nests, or on the old ones that are shot. This badger eludes every attempt to trap him. Having more than once run narrow risks of this nature, he has become so cunning that no one can catch him. If a dozen baited traps are set, he manages to carry off the baits and spring every trap, always with total impunity to himself. At one time he was watched out to some distance from his drain, and traps were then put in all directions round it, but, by jumping over some and rolling over others, he escaped all. In fact, though a despised and maltreated animal, when he has once acquired a certain experience in worldly matters, few beasts show more address and cunning in keeping out of scrapes. Though eaten in France, Germany, and other countries, and pronounced to make excellent hams, we in Britain despise him as food, though I see no reason why he should not be quite as good as any pork. The badger becomes immensely fat. Though not a great eater, his quiet habits and his being a great sleeper prevent his being lean. The immense muscular power that he has in his chest and legs enables him to dig with great rapidity, while his powerful jaws (powerful, indeed, beyond any other animal of his size) enable him to tear away any obstacle in the shape of roots, etc., that he meets with. He can also stand with perfect impunity a blow on his forehead which would split the frontal bone of an ox. This is owing to its great thickness, and also to the extra protection of a strong ridge or keel which runs down the middle of his head. A comparatively slight blow on the back of his head kills him. In his natural state he is more than a match for any animal that would be inclined to molest him, and can generally keep at bay any dog small enough to enter his hole. Fighting at advantage from behind some stone or root, he gives the most fearful bites and scratches, while the dog has nothing within his reach to attack save the badger's formidable array of teeth and claws. Though nearly extinct as one of the feræ naturæ of England, the extensive woods and tracts of rocks in the north of Scotland will, I hope, prevent the badger's becoming, like the beaver and other animals, wholly a creature of history, and existing only in record. Much should I regret that this respectable representative of so ancient a family, the comrade of mammoths and other wonders of the antediluvian world, should become quite extirpated. Living, too, in remote and uncultivated districts, he very seldom commits any depredations deserving of death or persecution, but subsists on the wild succulent grasses and roots, and the snails and reptiles which he finds in the forest glades, or, on rare occasions, makes capture of young game or wounded rabbits or hares, but I do not believe that he does or can hunt down any game that would not otherwise fall a prey to crow or weasel, or which has the full use of its limbs. It is only wounded and injured animals that he can catch. It is difficult to understand how any person who is not lost to every sense of humanity and shame can take delight in the cowardly and brutal amusement of badger-baiting — instead of amusement, I should have said, the disgusting exhibition of a peaceable and harmless animal worried by fierce and powerful dogs. The poor badger, too, has probably been kept for a length of time in a confined and close hutch, thereby losing half his energy and strength; while the dogs, trained to the work and in full vigour of wind and limb, attack him in the most tender and vulnerable parts. Truly, I always feel a wish to make the badger and his keeper change places for a few rounds. Not that I would pay the former so bad a compliment as to suppose that he would take delight in tormenting even so great a brute as his gaoler must be.